British television executive Balen (Kenneth Clarke, not reviewed) displays both understanding and incredulity in his account of the infamous 18th-century trading scandal. It was a remarkable story of fraud and political fixing, but it might have been worse, Balen writes; it could have spelled the doom of an entire economic system. The stupendous share-trading shenanigans he deliciously dissects could easily have besmirched and destroyed a mighty swath of English nobility: lords, ministers, MPs, and even King George IV sold their influence for a slice of the tainted pie. Balen makes the dirty doings fairly easily to digest, but readers will have to pay close attention to understand the queer world of share-trading and the sheer transparency of the fraud. The South Sea Company’s ships, he notes, “had not sailed anywhere near the South Seas” in 1720, and many saw through the scheme quickly enough to get out with their money. 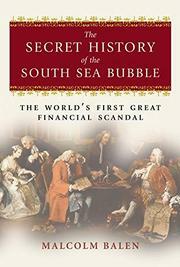 But the company had the king's imprimatur, the ear of people who could make things happen, and the political clout to close down other speculative operations that were siphoning off funds that might have been invested in South Sea. Ultimately, investors wanted to cash out, but of cash there was little, even though the paper debts they owed were still in effect. The roller-coaster ride ended when the whole foundationless edifice crashed, but the financial conflagration was contained, and the blue-blooded perps stood ready for another day of business. Canny Robert Walpole guided the post-crash inquiry in such a fashion as to screen important players, protect the established order, and secure a seat of power for himself.